I am practicing interview questions, I wrote this code to perform BFS and DFS on a graph in Python. How can it be optimized, and how can it be made more readable? 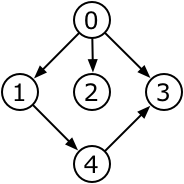 If the neighbours of 0 were added to the graph in the order 1, 2, 3, then the code in the post will visit the nodes in the order 0, 1, 4, 2, 3. But this is not a valid depth-first ordering — after 0, 1, and 4, the next node should be 3. The problem arises because node 3 was already marked as visited when it was pushed onto the stack as a neighbour of 0, and so it fails to be visited as a neighbour of 4. This is a common mistake (see here for another example), because dfs as written would be a correct implementation of depth-first search on a tree (when there is exactly one path from the root to each node). It's only when there are multiple paths between nodes that the problem becomes evident. This incurs a little extra overhead compared to the code in the post — we end up pushing and popping each node once for each incident edge (rather than just once overall). But it visits the nodes in depth-first order. """Print graph nodes in depth-first order starting at node.""" but queue is implemented using a list, and unfortunately in CPython, popping the first element of the list is not efficient (all the other elements of the list get copied down to fill the vacated space). See the TimeComplexity page on the Python wiki. """Print graph nodes in breadth-first order starting at node.""" Bfs should at least be bfs. Some would probably argue that you should spell out depth_first_search and breadth_first_search entirely. I personally like small names, but regardless, the capital B should not be there. Not the answer you're looking for? Browse other questions tagged python graph breadth-first-search depth-first-search or ask your own question.